Made from 100% cotton and mill-treated for extra stiffness and more aggressive cutting than white ventilated buff. The stiffness and treated material require less pressure on the part. With less pressure and ventilated design, the workpiece stays cool reducing heat buildup and warpage, plus vented material holds compound longer. Use with Emery and Tripoli Compounds. Made in USA. 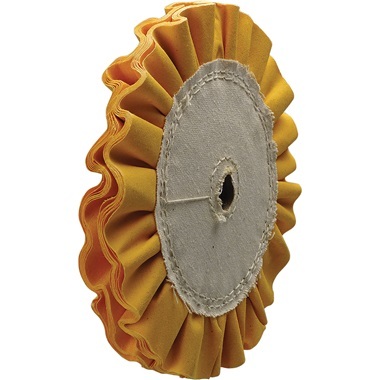 Ventilated buffing wheels keep your parts cooler by expanding when wheel is turning. Expanded surface allows air to enter buff, then transfers this cool air to your part, resulting in a much cooler buffing temperature. Corrugated face holds more compound than conventional buffing wheels. Corrugation creates pockets for compound to stick to, resulting in less compound consumption, faster cutting rates & longer wheel life. Resin board center for easy installation on all our buffers. No special flanges or spacers to buy. An exclusive design only available from TP Tools. 8" wheel diameter. Fits 3/4" arbor hole. For 3/4 HP buffer. 1" thick, 16-ply. Made in USA. 10" wheel diameter. Fits 7/8" arbor hole. For 1-1/2 HP buffer. 1" thick, 16-ply. Made in USA.